What is new at CMS and whats about science? Where are CMS productes used for scientific research? News and events like new product informations, upcoming conferences, exhibitions and press releases are posted on this page. We welcome you to visit us at the European Conference on Solar UV Monitoring in Vienna, Austria (12-14/09/2018). The European UV-Index Initiative. 5. Fachtagung Energiemeteorologie, Gosslar, Germany (5-7/6/2018). Präzise Vorhersage von Wettereinflüssen für ein stabileres Energiesystem. We will be pleased to demonstrate the latest All Sky Camera system to advance your field research. We welcome you to visit us at the 2nd International Workshop on Aerosol-Cloud-Radiation Interactions and Climate Effects in Nanjing, China (17-19/6/2017). We will be pleased to discuss the latest measurement systems to advance your field research. 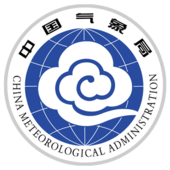 Organized by China Meteorological Administration, Jiangsu Institute of Meteorology Atmospheric Physics and Artificial Weather, Joint Laboratory of Solar Radiation Monitoring, Bejing Top Flag Technology Co and Nanjing University of Information Science and Technology. There is an ongoing demand on automated cloud analysis by meteorological research institutes and industry. Therefor CMS developed a state of the art All Sky Imager "ASI-16" which replaces our proven VIS-J1006 "CloudCam". ASI-16 is based on the very latest state-of-the-art imager and IP network technologies. It is optimized for scientific and industrial operations in very harsh environments. Ventilation and T-/DP-controlled air heating reduced any condensing on the dome. Image shootings can be scheduled with up to 2 pics @ 10 sec's. In parallel, a live stream is delivered (web-based GUI interface). ASI-16 includes a web-managed data logger and precision T-/RH- sensors. All data can be transferred via TCP/IP to a variety of network server types. In case of network-/server-down all data are stored locally, on the ASI. The Thematic Network for Ultraviolet Measurement in conjunction with the EMRP UV Intercomparison 2014 will arrange a two-day workshop (15-16/7/2014). The workshop will be hosted by the Physikalisch-Meteorologisches Observatorium Davos, World Radiation Center in conjunction with the UV-Intercomparison 2014. COST - Europen Cooperation In Science And Technology. University of Patras, Greece (24-25/6/2014). We will be pleased to demonstrate the All Sky Camera for cloud detectin and analysis software. We welcome you to visit us at the EGU 2014 in Vienna, Austria. (27/4-1/3-2014). We will be pleased to demonstrate the latest measurement systems to advance your field research. We welcome you to visit us at the Dach in Innsbruck, Austria (2-6/9/2013). Die Deutsch-Österreichisch-Schweizerische Meteorologentagung. We will be pleased to demonstrate the latest measurement systems to advance your field research. The second annual EMRP ENV03 project Meeting took place at the Physikalisch-Meteorologisches Observatorium Davos, World Radiation Center (29-30/8-2016). CMS Ing. Dr. Schreder GmbH signed a distributor agreement of its UV stability Kit for the Brewer with Kipp&Zonen B.V. The kit is supplied with a Precision Power Supply and three pre-aged and calibrated 200 W quartz halogen lamps that have little variation. The annual EMRP ENV03 project Meeting at the Physikalisch-Technische Bundesanstalt in Berlin (14-18/8/2012). Eine Tagung der Deutsche Akademie für Photobiologie und Phototechnologie, Heidelberg, Germany (29/5-1/6/2012). Strahlungsmonitoring in der Medizin, Biologie und bei technischen Prozessen. We will be pleased to demonstrate the latest Sunnglass measurement system with data according to EN ISO 12311 (Personal eye protection). CMS at 7. 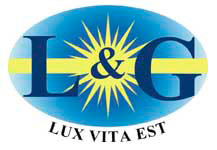 Sympossioum Licht und Gesundheit 2012. Eine Sondertagung der TU Berlin gemeinsam mit DAfP und LiTG, Berlin (15-16/3/2012). We welcome you to visit us at the Meteohydex 2011 in Geneva, Switzerland (23-25/4/2011). We will be pleased to demonstrate the latest measurement systems to advance your field research. Location: L43. We welcome you to visit us at the Extzremwetterkongress 2011 in Hamburg, Germany (12-15/4/2011). We will be pleased to demonstrate the latest measurement systems to advance your field research. Location: Hauptgebäude der Universität Hamburg. We welcome you to visit us at the EGU 2011 in Vienna, Austria (4-8/4/2011). We will be pleased to demonstrate the latest measurement systems to advance your field research. CMS is partner in the European Joint Research Project "Traceability for surface spectral solar ultraviolet radiation". This project is a collaboration between National Metrology Institutes (NMI's), the research community in Europe and partners from industry. CMS Ing. Dr. Schreder GmbH arranged a distributor agreement of its All Sky Camera with EKO Instruments Europe B.V. It will be distributed as SRF-02 All Sky Camera. The symposium will be hosted by the Österreichische Akademie der Wissenschaften (22/4/2008). Agreement of development and technology transfer of Photometric Transfer Standards (LED) between CMS Ing. Dr. Schreder GmbH and Pysikalisch Technische Bundesanstalt (Group 4.12, Optic/Photometry, Braunschweig). Agreement of technology transfer of deuterium lamp UV Transfer Standard (DLS) between CMS Ing. Dr. Schreder GmbH and Pysikalisch Technische Bundesanstalt (Group 4.11, Optic/Spectroradiometry, Braunschweig). Agreement of technology transfer of Portable Spectral Irradiance Transfere Standard (Halogen Lamp, 200 W) (DLS) between CMS Ing. Dr. Schreder GmbH and Pysikalisch Technische Bundesanstalt (Group 4.11, Optic/Spectroradiometry, Braunschweig). Blumthaler M., Klotz B., Schwarzmann M., Schreder J. (2016): The Austrian UV Monitoring Network. IRS2016, International Radiation Symposium, Auckland, New Zealand (16-22/4/2016). Kärhä P., Mes J., Pulli T., Schreder J., Partosoebroto A., Hülsen G., Askola J., Gröbner J. (July 2014): Improved diffusers for spectroradiometers measuring solar irradiance. UV News, The official newsletter of the Thematic Network for Ultraviolet Measurements. UV News, Issue 10, pp. 25-27. Pulli T., Kärhä P., Schreder J., Mes J., Partosoebroto A., Ikonen E. (2014): Realization of Improved Solar UV Diffusers. Proceedings of the Newrad 2014, Espoo, Finland, June 24 - 27 (2014). Pulli T., Kärhä P., Mes J. Schreder J. (2013): Software for designing solar UV diffusers UV News, The official newsletter of the Thematic Network for Ultraviolet Measurements. UV News, Issue 9, pp. 7-9. Johnsen B., Kjeldstad B., Aalerud T.N., Nilsen L.T., Schreder J., Blumthaler M., Bernhard G., Topaloglou C., Meinander O., Bagheri A., Slusser J.R., Davis J. (2008): Intercomparison and harmonization of UV Index measurements from multiband filter radiometers. Journal Of Geophysical Research-Atmospheres, Volume 113 IssueD15, Aug 12 2008. S. Thiel, L. Ammannato, A. Bais, B. Bandy, M. Blumthaler, B. Bohn, O. Engelsen, G. P. Gobbi, J. Grobner, E. Jakel, W. Junkermann1, S. Kazadzis, R. Kift, B. Kjeldstad, N. Kouremeti, A. Kylling, B. Mayer, P. S. Monks, C. E. Reeves, B. Schallhart, R. Scheirer, S. Schmidt, R. Schmitt, J. Schreder, R. Silbernagl, C. Topaloglou, T. M. Thorseth, A. R. Webb, M. Wendisch, and P. Werle (2008): Influence of clouds on the spectral actinic flux density in the lower troposphere (INSPECTRO): overview of the field campaigns. Atmos. Chem. Phys., 8, pp 1789-1812, 2008. Huelsen G., Gröbner J., Bais A., Blumthaler M., Disterhoft P., Johnsen B., Lantz K. O., Meleti C., Schreder J., Vilaplana Guerrero J. M., Ylianttila L. (2008): Intercomparison of erythemal broadband radiometers calibrated by seven UV calibration facilities in Europe and the USA. Atmos. Chem. Phys., 8(16), pp 4865-4875, 2008. Schallhart B., Blumthaler M., Schreder J., Verdebout J. (2008): A method to generate near real time UV-Index maps of Austria. Atmospheric Chemistry and Physics, 8(24), pp7483-7491. Blumthaler M., Schreder J. 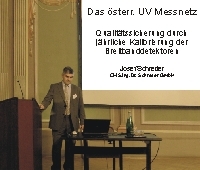 (2008): Dauerbetrieb des in Österreich installierten UVB-Messnetzes . The Austrian Federal Ministry of Agriculture, Forestry, Environment and Water Management. Hlavinka P., Trnka M., Semeradova D., Zalud Z., Dubrovsky M., Eitzinger J., Weihs P., Simic S., Blumthaler M., Schreder J. (2007): Empirical model for estimating daily erythemal UV radiation in the Central European region. Meteorologische Zeitschrift, 16(2), pp 183-190. Weihs P., Simic S., Laube W., Blumthaler M., Kreuter A., Putz E., Gonzi S., Schmalwieser A., Schreder J. (2007): Measurements of UV irradiance within the area of one satellite pixel. UV conference PMOD/WRC, Davos Switzerland, 18.-20/9/2007. Groebner J., Blumthaler M., Kazadzis S., Bais A., Webb A., Schreder J., Seckmeyer G., Rembges D. (2006): Quality Assurance of spectral solar UV measurements: Results from 25 UV monitoring sites in Europe, 2002-2004. Metrologia, 43, pp 66-71. Bais A., Kazadzis S., Garane K., Kouremeti N., Gröbner J., Blumthaler M., Seckmeyer G., Webb A., Koskela T., Görts P., Schreder J. (2005): Portable device for characterizing the angular response of UV spectroradiometers. Applied Optics, 44(33), pp 7136-7143. Groebner J., Schreder J., Kazadzis S., Bais A.F., Blumthaler M., Goerts P., Koskela T., Tax R., Seckmeyer G., Webb A.R. (2005): A travelling reference spectroradiometer for routine QA of spectral solar UV irradiance measurements. Applied Optics, 44(25), pp 5321-5331 . Huber M., Blumthaler M., Schreder J., Schallhart B., Lenoble J. (2004): Effect of inhomogeneous surface albedo on diffuse UV sky radiance at high-altitude site Journal of Journal of Geophysical Research, Vol. 109, doi: 1029/2003JD004013, 23.4.2004. Schreder J., Blumthaler M., Huber M. (1999): Design of an input optic for solar UV-measurements. Internet Photochemistry & Photobiology, Issue: Protection against the hazards of UV, Feb. 1999. Bais A. , Topaloglou C., Kazadzis S., Blumthaler M., Schreder J., Schmalwieser A., Henriques D., Janouch M. (1999): Report of the LAP/COST/WMO intercomparison of erythemal radiometers. WMO/GAW report No. 141, World Meteorological Organization, Geneva, 1999. Schreder J., Blumthaler M. (1998): Improved Cosine Diffuser for solar UV-measurements. UV NEWS The official newsletter of the Thematic Network for Ultraviolet Measurements, Issue 1, September 1998. Schreder J., Blumthaler M., Daxer A., Ettl A. (1998): Absorption von Chibro-Uvelin Augentropfen für UV-Schutz. Zeitschrift für Medizinische Physik. Volume 8, Issue 3, pp 150-152, 1998. Kylling, A., Bais A., Blumthaler M., Schreder J., Zerefos C.S. (1998): Effect of aerosols on solar UV irradiances during the Photochemical Activity and Solar Ultraviolet Radiation campaign. Journal of Geophys. Research, Vol. 103, No. D20, pp 26051-26060, October 1, 1998. Daxer A., Blumthaler M., Schreder J., Ettl A. (1998): Effectiveness of Eye Drops Protective against Ultraviolet Radiation. Ophthalmic Research, 30(5), pp 286-290, 1998. The Atmospheric Water Vapor Effect on Direct Normal Irradiance Under Clear Skies. DOI: 10.1007/978-3-319-35095-0_167. In book: Perspectives on Atmospheric Sciences, pp.1163-1168. Vergleich von Vorhersagemethoden der solaren Einstrahlung mit Wolkenkamera. 4. Fachtagung Energiemeteorologie, Bremerhaven (20-22.4.2016). Einfluss von Inhomogener Bewölkung auf den PV Ertrag. 4. Fachtagung Energiemeteorologie, Bremerhaven (20-22-4-2016). Cloud detection and movement estimation based on sky camera images using neural networks and the Lucas-Kanade method. 3. AIP Conf. Proc. 1850, 140020 (2017); doi: 10.1063/1.4984528. A multi-dimensional criteria algorithm for cloud detection in the circumsolar area. 3. International Conference Energy and Meteorology, Boulder, Colorado USA (22-26/6/2015). Assessment of solar radiation resources in Saudi Arabia. Solar Energy 119, 2015 pp 422-438. Cloud Radiative Effect in dependence on Cloud Type. Geophysical Research Abstracts, Vol. 17, EGU2015-6067, 2015. Computation of Advanced Sky Condition Using Neural Networks and Motion Detection. Masters Thesis, Pekko Tuominen, Univestität Helsinki. (21.11.2015). Neural Networks and Support Vector Machine Algorithms for Automatic Cloud Classification of Whole-Sky Ground-Based Images. IEEE Geosince and Remote Sensing Letters, Vol. 12, No. 3, (March 2015). Effect of clouds on solar irradiance (ECSOL - PROGNOSIS). Project Universitatea Transilvania din Bracov, Cyprus University of Technology (2014-2015). Overview of Best Practices for Solar Resource Measurements. Solar Resource Solutions LCC, National Renewable Energy Laboratory, USA. Webinar, (7.5.2015). Cloud observations in Switzerland using hemispherical sky cameras. Journal of Geophysical Research: Atmospheres, 120, pp 695-707, doi: 10.1002/2014JD022643, (2015). Potential impact of contrails on solar energy gain. Atmos. Meas. Tech., 8, pp 1089–1096. Probing the upper troposphere by watching aircraft. EMS Annual Meeting Abstracts, Vol. 12, EMS2015-638, 2015. VORKAST. Short-term forecasts of wind and PV power levels. Project funded by the Federal Ministry for Economic Affairs and Energy, Germany. Realised by ZSW & SWE (01.09.2014 – 28.02.2017). Wide-Range Solar Resource Forecasting Using Radiation Measurements, All-Sky Camera Imagery and High-Resolution Large-Eddy Simulations on a GPU. EU PVSEC 2014, 5BV.1.9, Munich, Germany (23/9/2014). Minutes-ahead solar resource forecasting based on sky camera imagery. Fachtagung Energiemeteorologie, Grainau, Germany (4-6/6/2013). Minutes-Ahead Solar Resource Forecasting by Combining Sky Camera Images and Solar Radiation Monitoring. EU PVSEC 2013, 5AO.9.2, Munich, Germany (30/9/2013). Detektion und Untersuchung solarer Strahlungsüberhöhungen mit ARAD und Cloudcam. 5. Österreichischer MeteorologInnentag, Feldkirch, Austria, ( 7-8/11/2013). Weihs P., Feitzingera E., Baumgartner D., Wagner J., Rennhofer M., Laubea W., Gadermaier J. (2013): Investigation of the Effect of Contrails on Direct and Diffuse Irradiance. 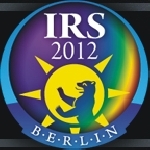 Radiation Processes in the Atmosphere and Ocean (IRS2012). AIP Conf. Proc. 1531, pp 536-539; doi: 10.1063/1.4804825. PROJECT CL.E.A.R. CLoudiness Experiment for Automatic Recognition. WMO Technical Conference on Meteorological and Environmental Instruments and Methods of Observation (TECO 2012), Brussels, Belgium. Session 1 - Instruments Intercomparisons and Testbeds, P1(5). Cloud climatology and Surface radiative forcing over Switzerland. GAW-CH 16 May 2012. All-sky imaging: a simple, versatile system for atmospheric research. 1 March 2009 / Vol. 48, No. 7 / Applied Optics. Inhibition of the POS-mediated cytotoxicity and genotoxicity of nano-TiO2 toward human keratinocyte cells by iron doping. Journal of Nanoparticle Research, 16:2263, (February 2014). Spectrometer and Radiative Transfer Model Comparison using High Sun In-Situ Observations in Pretoria. AIP Conf. Proc. 1531, 524 (2013). Solar irradiance on inclined surfaces in Jokioinen, Southern Finland during snow-covered spring conditions. Vol.10, EMS2013-253, GF88. 13th EMS / 11th ECAM. (8.-13./9/2013).